Because of the Department’s a strong interest in popular fiction, Nigel Algar, Senior Curator (Fiction) of the British Film Institute, donated to us the popular fiction collection of the late Tom Milne. 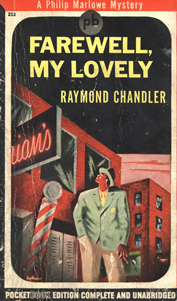 The collection is particularly strong on hard-boiled fiction of the 1940s and 1950s and on the writers whose work formed the core of canonical film noir: Chandler, Hammett, James M. Cain, Horace McCoy, David Goodis, Cornell Woolrich, Dorothy B. Hughes, etc. As well as attracting visiting writers and scholars to Lancaster, the collection constitutes a substantial addition to the Department’s undergraduate and postgraduate studies of film and popular culture. When Tom Milne’s career path took him into the world of the film critic, he joined the British Film Institute as associate editor of Sight and Sound and editor of the Monthly Film Bulletin. Leaving the Film Institute to go freelance he wrote as a film critic for the Times, theFinancial Times, the Observer and edited the definitive Time Out Film Guide. He also contributed to such major works as the Oxford Companion to the Theatre, and the Fontana Dictionary of Modern Thought. – From the ‘Masters of Cinema’ page dedicated to Tom Milne, which also includes tributes by Nigel Algar and others. The Tom Milne fiction collection contains several hundred vintage novels, including rare editions of Raymond Chandler, David Goodis, Jim Thompson, Cornell Woolrich and many other of the great mid-century American paperback writers. It also includes a large collection of Westerns and vintage pulp magazines. 14th January – 11th February 2011: The Tom Milne Popular Fiction Archive: Preview Exhibition – From 14th January through 11th February 2011, the Lancaster University Library showcased the recently acquired Tom Milne Archive of Popular Fiction. The exhibition contained dozens of paperback novels and pulp magazines. The collection is particularly strong on hard-boiled fiction of the 1940s and 1950s and on the writers whose work formed the core of canonical film noir. 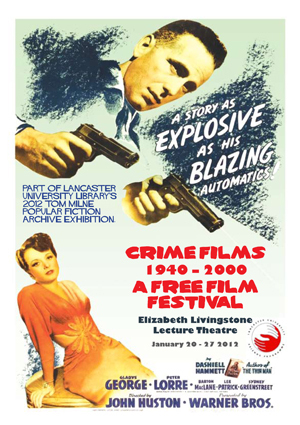 17th January 2012: The Tom Milne Popular Fiction Archive: 2012 Exhibition, Texts into Films – Starting on 17th January, Lancaster University Library will open its 2012 Exhibition of novels from the Tom Milne Archive, focusing on the influence of mid-century American crime fiction on film noir and neo-noir. Between Friday 20th and Friday 27th January, the Exhibition will be accompanied by a free film festival, with showings of a mixture of classic film noir and post-1960s neo-noir. 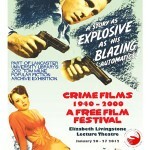 The Festival runs from Friday 20th January to Friday 27th January, and is open to all members of Lancaster University. It will show a mixture of classic film noir and post-1960s neo-noir every evening in the Elizabeth Livingstone Lecture Theatre. All of the films are based on books displayed in the Exhibition. The 1920s -1930s: the Heyday of the Pulps – In addition to paperback novels novels, the Milne Archive contains dozens of examples of the great days of pulp publishing in the 1920s and 1030s. The collection includes both science fiction and crime fiction pulps – for example, Black Mask, Thrilling Detective, Detective Fiction Weekly, Astounding Science-Fiction, Worlds Beyond and Weird Tales. The Paperback Revolution of the 1940s and 1950s – Tom Milne built up an extensive library of popular fiction during a lifetime of collecting. His collection contains nearly three thousand vintage novels and is particularly strong on the hard-boiled crime fiction of the 1940s and 1950s. This body of fiction was extensively represented in the Preview Exhibition of the Archive. Hard-Boiled and Noir Writers Featured in the 2011 Milne Archive Preview Exhibition – The 2011 Milne Archive Preview Exhibition showcased the work of some of the writers who were most important in establishing the traditions of American hard-boiled and noir crime fiction between the 1920s and the 1950s: Dashiell Hammett, Raymond Chandler, David Goodis, Steve Fisher, Cornell Woolrich, Jim Thompson, Patricia Highsmith.